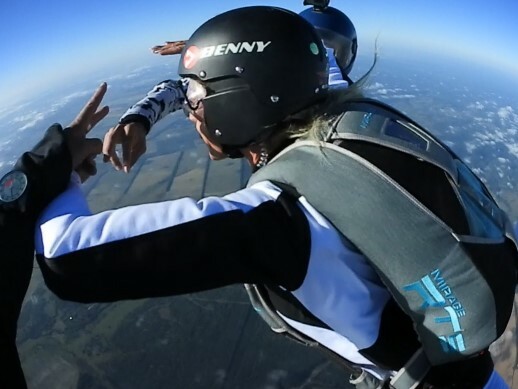 While not officially part of the Accelerated Free-Fall course, it is a very good idea and thus strongly recommended for a first-timer, to start off his or her skydiving career with an introductory tandem jump. The advantage for the student in doing so, is to experience and get somewhat accustomed to, the sometimes sheer overwhelming thrill and excitement of free-fall and terminal velocity with a fun and low-pressure first jump. Upon arrival at the drop-zone all student skydivers are required to register with the Flight Club skydiving school. As part of the registration process you will be required to fill out and sign a liability release form. This waiver will verify that each student skydiver understands that there are inherit risks involved in skydiving and that each participant freely agrees to accept those risks. 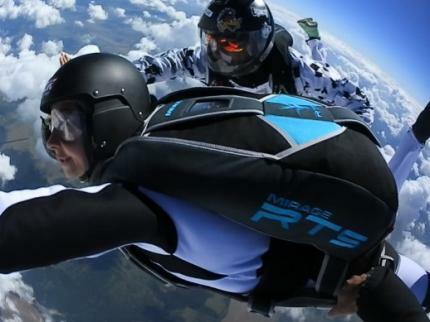 This legal release will usually contain a covenant by which the participant agrees to not sue the skydiving school, or anyone else involved in the skydiving operation, if the participant suffers an injury during the process. Each person wishing to engage in skydiving activities must meet USPA’s Basic Safety Requirements for medical fitness. Generally speaking, a person wishing to skydive should be in good overall health and physical condition. You should not be on medication which could influence sound judgement or performance. Any kind of drug or alcohol abuse is prohibited. People who have recently been scuba-diving or donated blood, should inform their instructor and should wait a period of time before skydiving. Please notify your AFF instructor of any previous injuries or any other medical conditions which might affect your ability to skydive safely, such as dislocated shoulders, poor eyesight, epilepsy etc. Minimum legal age requirements for skydiving students are set by each country’s respective governing civil aviation authority. At Aerograd Kolomna you can start your skydiving career with 16 years of age, provided you have written legal consent of both parents. 1. WHAT IS ACCELERATED FREE-FALL TRAINING? The Accelerated Free-Fall course, short AFF course, is a method of freefall training for student skydivers. It is called "accelerated" because it is internationally recognized as the most efficient form of frefall training and thus, the fastest way for skydiving students to learn the skills necessary in order to safely experience solo free-fall and skydive entirely self-supervised. The USPA AFF course is based upon a series of 9 successive levels and follows a simple to complex skills development strategy. That means, you will have to satisfactorily complete the targeted learning objectives of each level before being allowed to progress to the next and more challenging level. Depending on the AFF student’s personal need and circumstances, it might therefore be necessary to repeat individual levels before being able to safely progress to the next task. During the first 3 levels of the USPA AFF course you will be accompanied by 2 AFF instructors. On each level they will gradually grant you more and more freedom in free-fall. Typically by jump # 3, the AFF student will experience his or her first full release, meaning that both AFF instructors will let go of you entirely, allowing for you to find your balance without anybody hanging on to the student harness. Once an AFF student has proven basic survival and free-fall skills such as stability-, heading- and hover control and is able to deploy his or her parachute unassisted at a pre-assigned altitude, training will resume with only one AFF instructor in USPA AFF course levels 4 through 9. HOW DOES THIS WORK? THE AFF COURSE EXPLAINED. Accelerated Free-Fall training skydives are also referred to as "harness hold" jumps. The AFF student wears his own parachute and is accompanied by two AFF instructors, each holding on to the AFF student’s harness during exit and free-fall. AFF instructors serve as coaches and life-guards in free-fall, using hand signals to communicate with the AFF student and providing physical assistance when necessary. AFF instructors will stay with their student until the student’ s parachute has been deployed, before flying away and deploying their own parachutes. 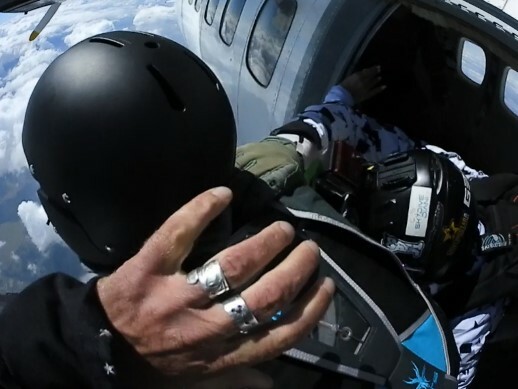 During these later stages of the Accelerated Free-Fall course, the AFF instructor will allow the AFF student maximum freedom to find his or her own wings. Your AFF instructor will guide you step-by-step through more advanced skydiving tricks, like determining the right spot over ground to exit the aircraft, performing solo exits and fly-aways, maintaining free-fall control around all axis with turns, rolls and loops, re-gaining stability within 5 seconds after performing aerobatics and landing your parachute without radio assistance in a designated landing area. Once an AFF skydiving student has successfully demonstrated all necessary skills to pass AFF course level 9, he or she will be cleared for free-fall self-supervision and can go for the first ever solo free-fall skydive. Since you will be wearing your own parachute, you will need to familiarize yourself during this introductory session with all survival skills necessary to safely start into your skydiving career. Your AFF instructor will thoroughly train you to handle emergency situations, which might occur during the flight to altitude, in free-fall and during deployment. Your instructor will also thoroughly teach you how to safely pilot your parachute and handle both ordinary and extraordinary landing procedures. During this initial ground school session, as well as before the first AFF jump, all AFF skydiving students are required to pass oral, written and practical tests. These tests are being administered with the intent to have the student proof his or her knowledge and understanding of each topic, to demonstrate sound situational awareness and decision-making and to give skydiving students an opportunity to correctly practice procedures with sufficient repetition and to generally hone their skills. These tests will both, assist your instructor in determining your personal state of preparedness and give you confidence that you have been adequately trained to safely make your first AFF skydive. Depending on the number of participants in the class and on the individual learner’s personal needs, an AFF course first ground school will typically last several hours. 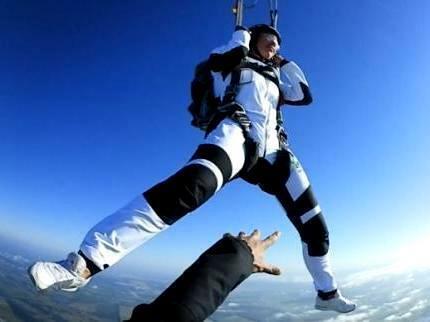 The first skydive can usually be accomplished on the same day. Indoor skydiving simulators offer the opportunity to train certain motor-skills in a fun and low-pressure environment. Equipped with muscle memory and confidence in your flying abilities, you have a fair chance of successfully translating these skills into the mentally more demanding free-fall terminal velocity environment. Incorporating indoor free-fall simulator time into your AFF course lead-up training will dramatically increase your chances for a successful and no drama completion of your Accelerated Free-Fall training. We categorically recommend you upgrade your chances by opting into this add-on before the first AFF jump. Of course, you can still request free-fall simulator time following your introductory tandem skydive, should you realize that you need more time in the wind to get fully accustomed, before going for the real thing in your AFF course level 1. 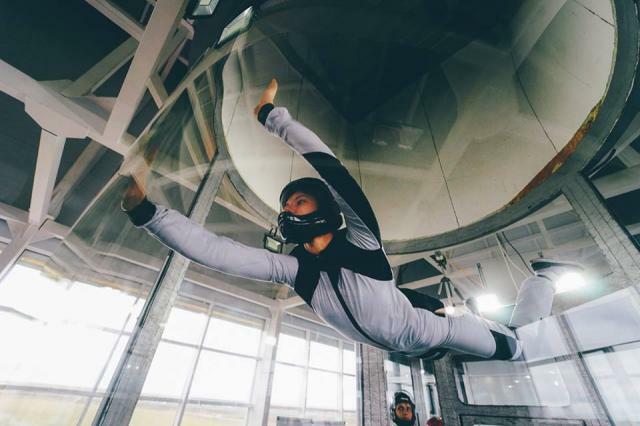 Wind-tunnel training sessions are also available on an "as needed basis" for AFF students who get stuck with any particular trick over the course of their Accelerated Free-Fall training. At this still very elementary stage of your skydiving career, about 30 minutes of free-fall simulator time will, generally speaking, be enough to get you going pretty strong. To learn more about indoor free-fall simulator training, please visit our wind-tunnel flying page. The drop-zone has a range of different options for onsite accommodation available which you can review and book directly at the same link and via the same e-mail address. Experience has shown, that skydiving students who choose to familiarize themselves with their new environment while being safely attached to a professional pilot during a tandem skydive, have exponentially higher chances of successfully completing the first levels of the Accelerated Free-Fall course than those skydive students who decided to skip this familiarization process and instead insist on winging it on their own the very first time around. You can upgrade this introductory tandem skydive experience with an in-air video and photo series. This is not only an eternal memory of your first ever skydive which you can share with friends at home, but also an effective debriefing tool and thus a valuable learning aid. The Flight Club skydiving school at Aerograd Kolomna operates 7 days a week starting from mid April through mid Oct and you can complete the entire AFF course program (level 1 through level 9) usually in about 8 days onsite (weather permitting). During the off-season we operate weekends only and longer delays might occur due to adverse Russian winter weather conditions. 6. HOW CAN I CONTINUE MY SKYDIVING CAREER AFTER THE ACCELERATED FREE-FALL COURSE? QUALIFY FOR AN ENTRY-STAGE SKYDIVING LICENSE! Well, now you have reached the stage in your skydiving career where it is time to learn and master some more advanced skydiving tricks so you can share this exhilarating feeling of speed and freedom with your new friends on the drop-zone. In short, it' s time for you to start flying with other skydivers. As you now already know, a skydiver is considered a student until he or she has obtained a skydiving licence. While on student status, a skydiver must either skydive under supervision of an appropriately rated USPA instructor or, once he or she has successfully completed their Accelerated Free-Fall training, is allowed to skydive "solo" - meaning self-supervised and alone. Accordingly, in order for you to legally and safely skydive with other licensed skydivers, you will first need to get some follow-up freefall training in formation skydiving techniques and qualify for an entry-stage skydiving licence. In the USPA system, this entry-stage qualification is called "USPA A-licence". WHAT EXACTLY AM I ALLOWED TO DO WITH AN USPA A-LICENCE? at least 25 skydives under their belt, hold a current USPA membership, successfully completed all requirements listed on the USPA A-license proficiency card. In order to complete the requirements listed on the USPA A-license proficiency card, you should plan on doing some more solo skydives, minimum 7 additional freefall training jumps with a personal coach honing your formation skydiving skills and demonstrate your level of proficiency in a final USPA A-license graduation jump. You also have to learn to pack your own parachute and pass an oral and written exam. For a detailed description of the USPA A-license training and certification process and associated tuition fees, please check our comprehensive USPA skydiving license tutorial. To sign up for an USPA AFF course with the Flight Club skydiving school at Aerograd Kolomna, please complete and submit the online booking request form. You can lock in preferred course dates with us. ACCELERATED FREE-FALL SKYDIVING COURSE. LEARN TO SKYDIVE IN RUSSIA. Master fundamental skydiver survival skills and tricks for freefall and parachute piloting in our Accelerated Free-Fall course. Find out how you too can become a self-supervised skydiver, right here in our comprehensive Accelerated Free-Fall course tutorial: learn all there is to know about the structure of this entry-stage skydiving course, registration pre-requisites, course duration, associated tuition fees and booking procedures. We welcome you to the Flight Club skydiving school, located right in the heart of the world famous aviation super-center Aerograd Kolomna near Moscow in Russia and wish you a fun time while finding your wings with us. Your training with us is being conducted by professional skydive instructors, carried out to international standards and in accordance with the current skydive student training syllabus of the United States Parachute Association USPA.